BACKGROUND: Genetic red cell disorders are common in Arabic countries with a significant burden on healthcare systems. OBJECTIVES: We aimed was to assess the level of awareness of Saudi females toward potential risk of the most common inherited anemia in the region. METHODS: A cross-sectional questionnaire-based study was undertaken on 386 undergraduate students. RESULTS: The majority (60%) of participants have a poor knowledge score. The self-reported incidence of sickle cell anemia, glucose-6-phosphate dehydrogenase deficiency, and thalassemia among them was 7.3%, 4.9%, and 3.4%, respectively. Even though the majority (86.8%) expressed a positive attitude toward premarital screening tests, a wrong perception was noticed as 45.1% of them believe that irrespective of the test result, marriage decision will not be changed and 38.9% will refuse to marry a person who is a carrier of inherited anemia even if she is free of same disorder. Only 47.4% will refuse to marry a carrier if she was the carrier of some genetic disorders. CONCLUSION: Inadequate knowledge and wrong perception reflect the need to raise their awareness. Mass media should be greatly encouraged. Long-term regular targeted health education campaigns should be designed for adult Saudi, thereby reducing the burden and detrimental effect of these disorders in the community. In Saudi Arabia, the prevalence of hemoglobinopathies has been reported to be 27.66% by Alsaeed. Alharbi and Khan found that the prevalence of G6PD in the city of Riyadh is 4.76%, although vast variability exists of the recorded prevalence in other studies carried out in various provinces in Saudi Arabia. The highest records were found in two provinces near Riyadh city; Al-Qatif (45.9%) and Al-Hassa (36.5%). There is a general mounting concern that hemoglobinopathies might lead to a serious health threat worldwide in the upcoming 50 years. In Saudi society, which is essentially a tribal community as many Arab countries, there is a high proportion of consanguineous marriages at a young age and a large family size. Therefore, the recessive gene of hereditary disorders will apparently be evident in these communities over the centuries. Consequently, this population might suffer a serious health problem if preventive measures are not taken into consideration. Public awareness of these genetic disorders and premarital counseling can reduce the high incidence of these disorders among such nations. Despite the implementation of a compulsory Saudi national premarital screening (PMS) program, Alhamdan et al. pointed out in a study related to the Saudi national PMS program that reducing high-risk marriage was not felicitous, and there is a great need for more effort to heighten public awareness, and the time of screening in relation to marriage merits to be re-assessed. On planning a preventive program for hereditary disorders, focusing on the target population is a necessity, particularly young females, as their beliefs and perception will definitely affect their attitude toward choosing a partner and dealing with affected individuals. In spite of the importance of the hereditary red blood disorders in Saudi Arabia, there are no such data in the central region of Saudi Arabia. Hence, this study aimed to assess the level of awareness and perception/attitude toward the most common inherited anemia in the region and premarital counseling among adolescent Saudi females in one of the largest universities for women in the Middle East, Princess Nourah Bint Abdulrahman University (PNU) in Riyadh. All this information is intended to create a database that could be crucial in raising awareness through targeted education of Saudi females for healthier future generations. A cross-sectional descriptive survey was conducted on Saudi undergraduate students whom age ranged from 16 to 25 years at PNU from March to May 2016. The protocol was approved by the Ethical committee of the PNU Medical College. A convenient sample of students and administrative staff from different colleges who were willing to participate in the survey were selected after explaining the objective of the study and receiving the verbal consent from each of the participants. The total sample size was calculated using STATA 14 software (StataCorp. 2015. Stata Statistical Software: Release 14. College Station, TX: StataCorp LP) which amounted to 386 participants representing Saudi females from different colleges of the university. This was calculated by assuming that 50% of students are knowledgeable, ±10% level of precision, at 95% level of confidence (alpha = 0.05), and the power of study of 0.8 (beta error = 0.2). A semi-structured close-ended questionnaire, covering three of the most common inherited anemias in Saudi Arabia: sickle cell disease (SCD), thalassemia, and G6PD deficiency, regarding students' knowledge as well as their perception/attitude toward prevention of such diseases in the community, was developed by the authors guided by an extensive review of previous validated literature.,,,, A pilot study on a sample of 20 students was conducted to assess the questionnaire's validity and reliability, and Cronbach's alpha of the knowledge items was found to be 0.85, indicating internal consistency in the study questionnaire. The questionnaire includes three main parts. The first part comprises sociodemographic information of the participants including age, education level, field of study, marital status, economic status (monthly income), and personal and family history of hereditary anemia. The second part includes 27 items for assessing the participants' knowledge regarding prevalence, inheritance pattern, symptoms, consequences and complications, and preventive and treatment measures of hereditary anemia. The third part includes eight items for exploring the participants' perception/attitude toward accepting marriage between individuals who are affected and the PMS program used to prevent the spread of such diseases in the community. The data were analyzed using IBM SPSS software version 23 software (IBM, Armonk, NY, USA). The results of the descriptive analysis of sociodemographic data, knowledge, and perception/attitude toward hereditary anemia were tabulated. The knowledge score represents the sum of the correct answers of the 27 questions of the second part of the questionnaire. Value 1 was given to the correct answer, while value 0 for the wrong answer or for “don't know” responses. The cutoff point for the good knowledge score was set at values above 60% of the total score. Furthermore, the attitude was assessed using eight questions (negative and positive attitude if the correct question score was less than 50% and more than 50%, respectively). Testing the normality distribution of the knowledge score revealed normal distribution of knowledge; hence, the t-test and one-way analysis of variance were used for comparison of means. In contrast, testing the normality distribution of attitude revealed skewed distribution; hence, the Chi-square test was used to compare attitude among different subgroups. P ≤ 0.05 was considered statistically significant. This study included a total of 386 participants. All are Saudi educated females, at least at postsecondary education level. Their mean age was 25 ± 1.9 years. The sociodemographic data of the respondents are displayed in [Table 1]. The self-reported incidence of hereditary disorders among the participants was 27% (n = 103) [Figure 1]; however, 17% of them were not aware if they have any. The majority (60%) of women reported that they do not have enough knowledge about the inherited anemia. School/college was the major source of their knowledge (74.4%) followed by family/relatives (31.6%), media (27.5%), and healthcare services (25.9%), and the awareness campaign was the least (23.3%) [Figure 2]. The average total score of knowledge among the females was 13.48 ± 5; the minimum score was 0 out of 27 and the maximum was 25 out of 27. The response to different items is shown in a representative translation of the Arabic questionnaire [Table 2]. Considering poor knowledge as answering correctly <60%, 251 females (65%) were found to have poor knowledge. Further analysis of the total knowledge score of the participants according to sociodemographic traits [Table 3] revealed that neither the marital status, economic status, nor personal awareness of having the disorders had a significant influence on their knowledge score (P = 0.658, 0.509, and 0.625). 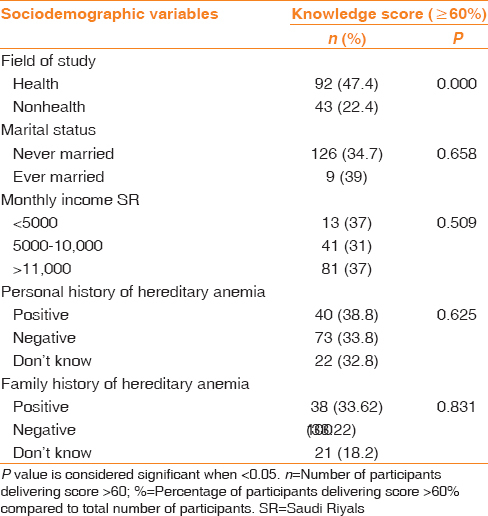 Their perception/attitude toward patients who have hereditary anemia illustrate a slightly different scenario where the economic status and the personal awareness of having the disorders were statistically significant (P = 0.005 and 0.000) but neither the marital status nor the field of study (P = 0.098 and 0.213). The field of study in health colleges, unsurprisingly, had an influence on participant's knowledge score (P = 0.000) but had no influence on their perception/attitude toward the disorders (P < 0.05). More than half of the participants (58.3%) knew that hereditary anemia, i.e. sickle cell anemia, thalassemia, and G6PD deficiency, is not rare in Saudi Arabia. 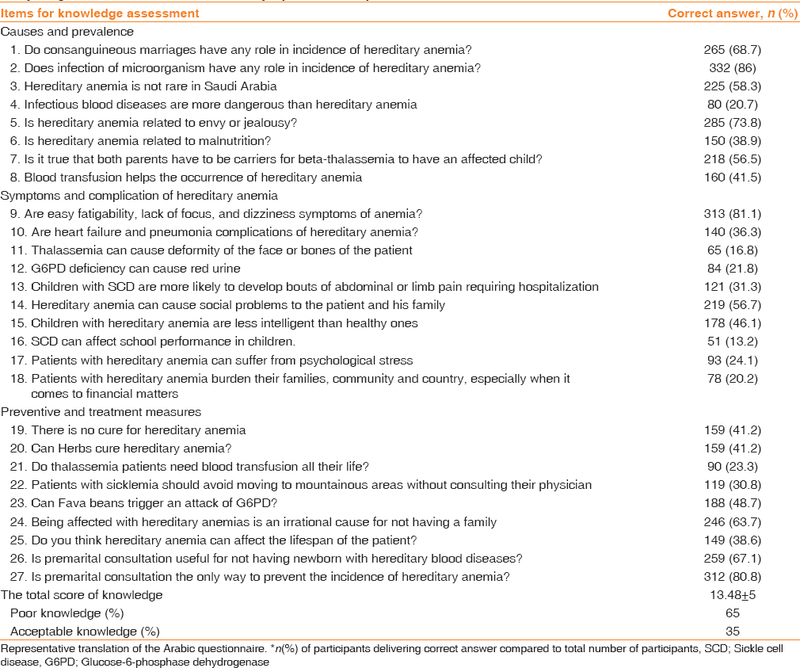 Concerning causes of hereditary anemia, the majority of the participants, 68.7% (n = 265), acknowledged that consanguineous marriage contributed to an increase in the prevalence of the disorders, while others have the misconception that the disorders can be acquired either from malnutrition (38.9%), infection (14%), or receiving blood transfusion (58.5%). Surprisingly, 26.2% (n = 101) believe that envy or jealousy can be a cause of these disorders. A minority of the participants (13.2%) knew that hereditary anemia might affect the performance of affected children at school, while more than half (53.9%) have the misconception that affected children with hereditary anemia are less intelligent than their counterparts. A smaller proportion of the participants (24.1%) thought that affected children may suffer from psychological stress. In response to knowledge on preventive measures, the majority (86.8%) of the participants agreed to their carrying out a PMS test, although less than half (41.2%) were aware that inherited anemias are entirely noncurable disorders. Surprisingly, more than half (58.8%) have the belief that herbs can cure hereditary anemia [Table 2]. When asked about premarital counseling, the majority of participants (67.1%) believe that carrying out a PMS test prevents the transmission of the disease to their offspring and it is necessary for the early detection of hereditary anemia, although 45.1% of them believe that irrespective of the test results, the decision to marry will not be changed. The analysis of the participants' perception/attitude toward patients with one of the hereditary anemias revealed that 63.7% of them believed that having one of these hereditary anemias is not an obstacle to marrying and having a family. Surprisingly, in response to the question on whether the genotype will influence the marriage decision, 38.6% of them will refuse to marry a person who is a carrier even if she herself is healthy and free of the same genetic disorders. Only 47.4% will refuse to marry an individual discovered to be a carrier of one of the hereditary anemias if she was also a carrier of the same genetic disorders [Table 4]. The important aspect of elevating the level of awareness and accuracy of information among the population about inherited disorders will play an ongoing role in prevention and control through changing behavior and minimizing the risk. Designing a prevention and control program of inherited anemia requires up-to-date epidemiological data; to the best of our knowledge, our study is the first one to explore such a prospective in Saudi Arabia. Our results showed that the majority of the participants (65%) had an inadequate (poor) knowledge score (<60%) toward the various aspects of inherited red blood disorders and had a negative attitude toward avoiding the potential risk of the disorders [Table 4], although the majority of them (86.8%) believed that PMS is necessary for the general public and agreed to carry it out in the future. Of course, a poor level of knowledge may influence having a poor level of attitude. In comparison with similar studies on other populations, a fair basic knowledge was reported from the studies carried out in Bahrain,,, Northern California, Ghana, and Iran (only 14.7% had good knowledge and >76% had positive attitude toward thalassemia). On the other hand, other population studies from Italian-American, Nigerian,,, and Indian regions were congruent with our findings concerning the lack of respondents' knowledge. The results of this study showed that the field of study of the participants in health colleges had an influence on participant's knowledge score (P = 0.000) but had no influence on their perception/attitude toward the disorders (P = 0.213). In agreement with our finding, Miri-Moghaddam et al. noted significant variation in the knowledge and attitude of students in different fields of study. Haque et al. also found that the field of study in health colleges correlates significantly with the high knowledge score in contrast to the lack of attitude that many will still marry if they are carrier. Therefore, it appears that health educational efforts are needed to raise the awareness, particularly among young females who are not related to the field of health, to bridge the awareness gaps between those females of different sociodemographic background. In contradictory to the previous studies,,, our results showed that the marital status had no significant influence on the knowledge score (P = 0.658). This can be explained by the low number of unmarried females among our undergraduate sample population. In the present study, more than half of the respondents (70.7%) stated that they know about their personal and family status if they are carriers or affected with any hereditary disorders, which is a far higher than that found in other similar studies from Italy, Bahrain,,,,, and Nigeria., This vast difference can be explained by the obligatory law of free mandatory PMS program in Saudi Arabia. 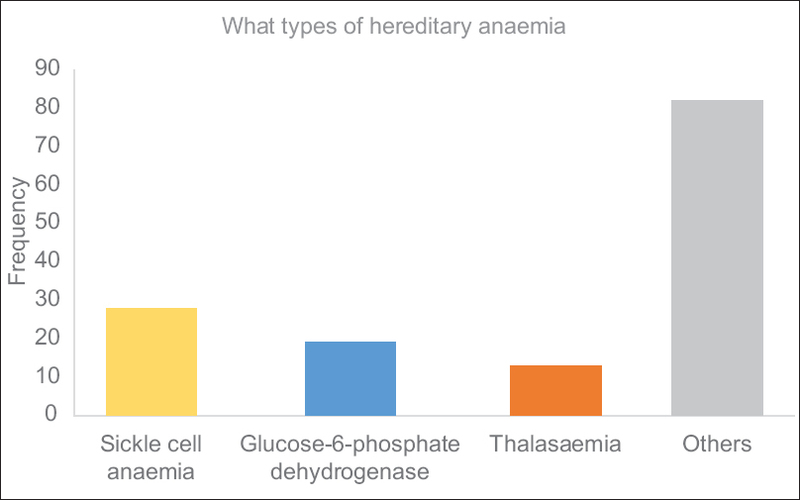 This study found that the prevalence of self-reported hereditary anemia was almost similar to the previous study reported by Hamamy and Al-Allawi. Out of 27% who declared having a hereditary disorder, 7.3% of them had sickle cell anemia, 4.9% had G6PD, and 3.4% had thalassemia [Figure 1]. Despite the awareness of the majority of the participants about the contribution of consanguineous marriage to increasing the prevalence of hereditary anemia, others thought that the disorders can be acquired through malnutrition, infection, receiving a blood transfusion, or evil spirits, other than being a hereditary disorder. Similar misconceptions were also observed in the previous studies conducted in Nigeria, and Bahrain., Therefore, it is strongly recommended that religious leaders and health providers take part in correcting these mistaken concepts. The participants' responses indicated that their specific knowledge regarding the preventive measures and treatment of the disorders was also poor. Surprisingly, 41.2% believed that herbs can cure hereditary anemia, and just only 41.2% were aware that inherited anemia are entirely noncurable disorders. In a similar study in Benin, about 61% believed that SCD is incurable. When respondents were asked about premarital counseling, the majority of participants (67.1%) agreed with the importance of premarital checking to reduce or prevent the incidence of transmission of the disease to their children, a finding which is similar to results in previous studies in Saudi Arabia, Bahrain, and Nigeria.,,, This indicates that the participants understand the importance of PMS in the prevention of genetic disorders. In Saudi Arabia, screening of hemoglobinopathies as part of a national PMS program has become mandatory for all couples preparing to marry before issuing their marriage certificate since 2005. However, approximately half of this study participants (45.1%) believe that irrespective of the test result, the marriage decision will not be changed although they expressed very positive attitudes toward genetic screening. In disagreement, a previous study conducted on a multiracial population reported that the implementation of the mandatory national PMS has dramatically decreased the incidence of thalassemia in newborns. In concordance with our results, Alhamdan et al. reported in their study, which was conducted as part of the Saudi national PMS program, that almost 90% of couples declared high-risk married each other despite being aware of the risk., Moreover, it was concluded in a study carried out on undergraduate unmarried female students in King Abdel Aziz University, Jeddah, Saudi Arabia, that student knowledge about the PMS program was generally poor before their educational program. It was also found in another study that the genetic counseling services provided did not have a significant impact on the marriage decisions of couples. Moreover, Memish and Saeedi indicated in another Saudi study that marriage certificates were issued irrespective of the results. Similar findings were also indicated in another study conducted on the Omani population as 16% said that they would terminate their engagement, while the remaining respondents stated that they did not want to interfere with God's will. The same finding was also reported in a study conducted among health sciences college students in Abha, Saudi Arabia. This pointed out that the misconception of Islamic rules is one of the reasons behind the negative attitude among some individuals. Therefore, clarification and correction of this misunderstanding need the reinforcement of health education in which religious leaders should be involved. Regarding the other negative attitude of the respondents, 38.9% of them will refuse to marry a person who is a carrier even if the respondent herself is healthy and free of the same genetic disorders. Only 47.4% will refuse to marry an individual discovered to be a carrier to one of the hereditary anemias if she were also a carrier to the same genetic disorders [Table 4]. These findings could be due to the young age of the females where they lack the ability to appreciate the seriousness of the hereditary red cell disorders and its enormous influence on the life of the affected families, particularly on their financial and emotional status. This reflects the need for a mass education campaign to be comprehensive and precise while focused on the alleviation of scientifically incorrect belief. The majority of the respondents have obtained their information on inherited anemia from schools/colleges (74.4%). Therefore, regular education sessions open to the females and their families can provide a significant improvement in awareness and knowledge. Family and relatives provide additional sources of information on PMS to approximately one-third of the participants. Unfortunately, the media and healthcare services failed to match expectations regarding spreading the information about the disorders, so more effort is needed to improve their services in this regard. This strengthens the need to involve healthcare providers and educators in workshops to highlight the significance of the PMS program [Figure 2]. Similarly, Orish et al. (2014) reported that schools have the highest influence on impacting knowledge while television had the least in Ghana. Al Kindi et al. 's study also showed that the school is the best channel for public health information. This reflects that its role is still not fully utilized to circulate the significant burden of these disorders on a national level. Public health education on genetic red blood disorders should be strengthened and available in an adequate period before couples start to plan for their marriage through mass media and the school curriculum. This will help foster and develop a positive perception/attitude toward limiting the potential hazards of hereditary anemia. This study has few limitations. The first limitation of this study is that the convenient sampling method. Furthermore, attitudes do not necessarily predict actual behaviors. Nevertheless, our justification is the adequate number of our sample, and the samples were selected as being representative from different colleges in the university. Inadequate knowledge and wrong attitudes reflect the need to raise awareness of hereditary anemia. We recommend that the mass media should be greatly encouraged to make more programs such as films, dramas, and talk-shows to correct these attitudes. Long-term, regular, and targeted health education programs and awareness campaigns should be designed and tailored for premarried Saudi females and future mothers to inform them of the disorders so that they can make informed choices when choosing a partner, thereby reducing the burden and detrimental effect of these disorders on the community. Orish VN, Onyeabor OS, Sanyaolu AO, Iriemenam NC. Evaluating the knowledge of sickle cell disease and hemoglobin electrophoretic pattern among people living in Sekondi-Takoradi Metropolis, Ghana. J Med Trop 2014;16:56. Rakholia R, Chaturvedi P. Prevalence of β thalassemia carrier state in Sindhi community of Wardha and evaluation of risk factors for β thalassemia trait. Niger J Clin Pract 2013;16:375-80. Durotoye IA, Salaudeen AG, Babatunde AS, Bosah EC, Ajayi FD. Knowledge and perception of sickle cell disease among secondary school students in Ilorin Metropolis. TJHS 2013;20:1-7. Hamamy HA, Al-Allawi NA. Epidemiological profile of common haemoglobinopathies in Arab countries. J Community Genet 2013;4:147-67. Miri-Moghaddam E, Motaharitabar E, Erfannia L, Dashipour A, Houshvar M. High school knowledge and attitudes towards thalassemia in Southeastern Iran. Int J Hematol Oncol Stem Cell Res 2014;8:24-30. Alsaeed AH. Prevalence of hemoglobinopathy disorders in adult patients sent for diagnosis of anemia in Saudi Arabia. Genet Test Mol Biomarkers 2012;16:25-9. Al Arrayed S, Al Hajeri A. Public awareness of sickle cell disease in Bahrain. Ann Saudi Med 2010;30:284-8. Al Kindi R, Al Rujaibi S, Al Kendi M. Knowledge and attitude of university students towards premarital screening program. Oman Med J 2012;27:291-6. Olakunle OS, Kenneth E, Olakekan AW, Adenike OB. Knowledge and attitude of secondary school students in Jos, Nigeria on sickle cell disease. Pan Afr Med J 2013;15:127. Alharbi KK, Khan IA. Prevalence of glucose-6-phosphate dehydrogenase deficiency and the role of the A-variant in a Saudi population. J Int Med Res 2014;42:1161-7. Alhamdan NA, Almazrou YY, Alswaidi FM, Choudhry AJ. 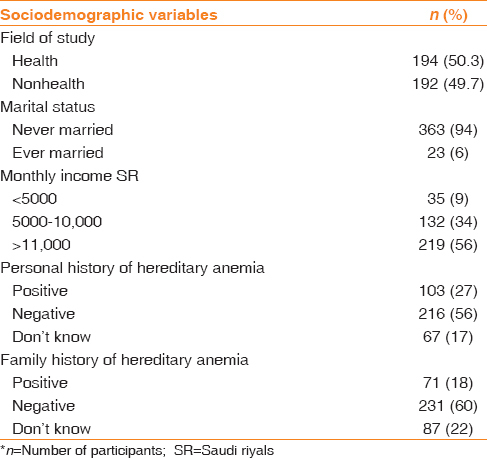 Premarital screening for thalassemia and sickle cell disease in Saudi Arabia. Genet Med 2007;9:372-7. Al Hajeri A, Al Arrayed S. Public awareness of beta thalassemia in Bahrain. Bahrain Med Bull 2012;34:26-9. Al Hajeri A, Al Arrayed S. Public awareness of glucose-6-phosphate dehydrogenase (G6PD) deficiency. Bahrain Med Bull 2011;33:147-9. Al-Arrayed S, Hafadh N, Amin S, Al-Mukhareq H, Sanad H. Student screening for inherited blood disorders in Bahrain. East Mediterr Health J 2003;9:344-52. Treadwell MJ, McClough L, Vichinsky E. Using qualitative and quantitative strategies to evaluate knowledge and perceptions about sickle cell disease and sickle cell trait. J Natl Med Assoc 2006;98:704-10. Armeli C, Robbins SJ, Eunpu D. Comparing knowledge of beta-thalassemia in samples of Italians, Italian-Americans, and non-Italian-Americans. J Genet Couns 2005;14:365-76. Adewuyi JO. Knowledge of and attitudes to sickle cell disease and sickle carrier screening among new graduates of Nigerian tertiary educational institutions. Niger Postgrad Med J 2000;7:120-3. Desai C, Bhandari K, Desai AM, Shah B. Awareness on sickle cell anemia in higher secondary school students of tribal area: An initiative. J Pharm Sci Bioscientific Res 2014;4:365-7. Haque AE, A'Thirahbt Puteh F, Osman NL, Amilin Z, Zain M, Haque M. Thalassemia: Level of awareness among the future health care providers of Malaysia. J Chem Pharm Res 2015;7:896-902. Wong LP, George E, Tan JA. Public perceptions and attitudes toward thalassaemia: Influencing factors in a multi-racial population. BMC Public Health 2011;11:193. Bhagwat GP, Bapat JP. Glucose-6-phosphate dehydrogenase deficiency in Bahrain blood donors. Bahrain Med Bull 1987;9:120-2. Al Arrayed S, Hamza A, Sultan B, Shome D, Bapat J. Neonatal screening for genetic blood diseases. Bahrain Med Bull 2007;29:88-90. Al Arrayed S. Frequency of G6PD Deficiency among Bahraini students: A ten years Study. Bahrain Med Bull 2010;32:18-21. Al Sulaiman A, Suliman A, Al Mishari M, Al Sawadi A, Owaidah TM. Knowledge and attitude toward the hemoglobinopathies premarital screening program in Saudi Arabia: Population-based survey. Hemoglobin 2008;32:531-8. Al Sulaiman A, Saeedi M, Al Suliman A, Owaidah T. Postmarital follow-up survey on high risk patients subjected to premarital screening program in Saudi Arabia. Prenat Diagn 2010;30:478-81. Zlotogora J. Population programs for the detection of couples at risk for severe monogenic genetic diseases. Hum Genet 2009;126:247-53. Jastaniah W. Epidemiology of sickle cell disease in Saudi Arabia. Ann Saudi Med 2011;31:289-93. Ibrahim NK, Al-Bar H, Al-Fakeeh A, Al Ahmadi J, Qadi M, Al-Bar A, et al. An educational program about premarital screening for unmarried female students in King Abdul-Aziz university, Jeddah. J Infect Public Health 2011;4:30-40. Memish ZA, Saeedi MY. Six-year outcome of the national premarital screening and genetic counseling program for sickle cell disease and β-thalassemia in Saudi Arabia. Ann Saudi Med 2011;31:229-35. Al-Kahtani NH. Acceptance of premarital health counseling in Riyadh city, 1417h. J Family Community Med 2000;7:27-34.